Much to our relief, and thanks to the weather gods, we had a much better day than last year. A bit of rain in the preceding days, was followed by beautiful conditions on race day. Unlike other reports I would like to open up with thanks to our volunteers, Steve and Mary. Steve was providing much assistance at the kayak start, and out on the dam. In fact, he covered around 10km on the water ensuring everyone was safe and not in trouble. He did have to tow one crew back who were having a bit of trouble. Meanwhile Mary was assisting at the registration/transition and bike areas. This allows us more freedom to get around to the competitors and out on course. 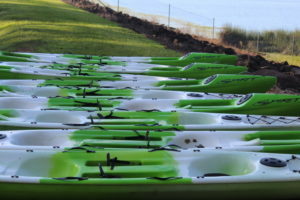 Grant from Navis Outdoors (kayak suppliers) was also extremely helpful in setting up and assisting people on the boats. 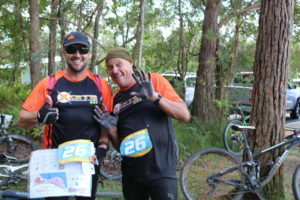 Adam and Tony also helped us in setting up and taking down the rego area. 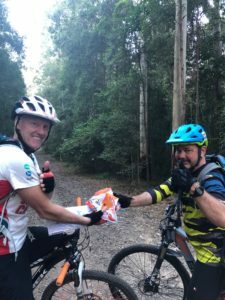 We also had a hand this afternoon from Jason McCartie (Believe in a Cause) with collecting the bike checkpoints. Thank you all for helping out. These races are very time consuming to get everything right on the day, and time passes extremely fast pre-race. This year we had a large group from Tri Adventure. I think there were 10 teams in total from their group. 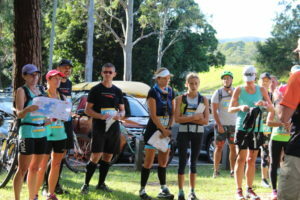 Some teams were strong, looking for a high placing, with others just keen to get out racing and test themselves. Family teams made up a large percentage of teams, and it great to see the younger people racing with their older people. Well done to Bray, Hugh, Neo, Nyle, Harrison, Edward, Finnbar, and Olivia for competing in their teams. These guys, and Olivia, are aged between 11 and 17 and we hope they keep racing as we would love to see them progressing in future years. The “girls in green” comprising the Elder Berries, Bike Bandits, and Nutty Nans, competed with lots of laughs. We have seen these ladies at a few races now, and they look to be improving all the time. We also had a couple of new teams that we met at the recent race at Wildhorse Mountain and told them of the event (Team BARC). Well done for backing up and hope you keep searching out more races. Similar to last year, we had a split start. Some headed off on the run; some on the mountain bike; and the rest were straight onto the water. The group that started on the kayak did the heavy lifting for most, by taking the kayaks down to the water, which I am sure was appreciated by the later groups. One team donned their pfd’s and grabbed their paddles and heading down to the water. Only thing was, they forgot to grab their kayak. That would have been a very tricky paddle, hey Team Froret. The water on the dam looked to be perfectly flat, although there was a bit of wind about, which I think increased throughout the day. Not sure if anyone noticed, but there seems to be a bit of a “tide” on the dam, with the water feeding into the treatment plant intake at the north-east corner of the dam. Unfortunately, we had a bit of trouble with the checkpoint marker on one the buoys. Not sure if a local fisherman nicked it or if it blew off. In any case, after we got wind of it, I thought I would take another marker out and get it replaced. Walking over those damned reeds is almost as hard as paddling though them. I proceeded to sink up to my chest before team Coastal Sledging came looking for the CP. Thankfully they paddled over so I could hand them the marker and replace the CP. For that I gave them a 5 minute bonus, which they duly ate up by coming home 11 minutes late. As usual, there were success stories on course, and some not quite so successful stories. We heard of one team, who folded their map and unfortunately hid a couple of the checkpoints from their view. This was a very experienced and well performed team, which just shows how small things can affect your race in this sport. I think we have all been down that track. Also, make sure you use tested equipment before race day (not a good idea to use a pair of gloves for the first time in a race and see all the colour rub off). Onto the pointy end of the race. 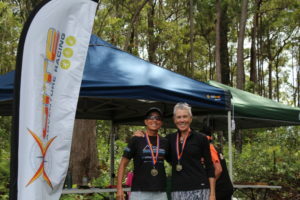 The Womens, and Overall, titles were taken by the Tri Adventure Aunties (Kim & Jan). 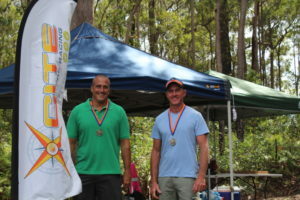 This comes as no surprise; however, they did manage to smash our course in 2h50min. It should also be noted that apparently they passed a guy on a tri bike riding up Tunnel Ridge Rd. I am sure he was impressed (or maybe humbled). In second place overall was the two Susies racing as Creak Groan 109. I saw these ladies on the bike leg coming down from CP16, and they weren’t too far off the Aunties. In the end, they were only 16 minutes behind, and had a great race to get so close to them. As a side note, I understand that the 109 relates to their combined ages (I will leave it up to those who know them to guess their respective ages). 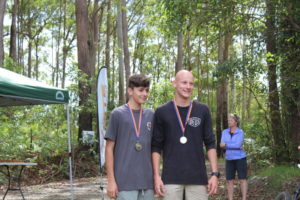 Team Froret scored third place, even with trying to kayak without a boat, and after suffering a 60 point penalty (they cleared the course, but were 6 minutes late). 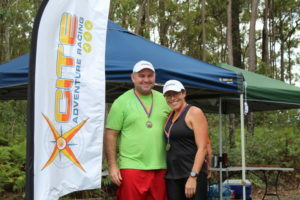 Third overall, and winner of the Family category, was Tri Adventure NR, by a minute of Tri Adventure NA. These two teams are from the same family, and even though they were racing around neck-and-neck, the team of Rick and Neo officially have bragging rights in the house. Nice gesture to have the two lads receive the winners medals. Those teams cleared the course, as did Believe in a Cause in third place (Family). The Mixed category was also a close affair, with Dodds Plods coming home a mere 2 minutes ahead of last years Mixed winners, Cannon Ball Run. Should be noted that Dodds Plods arrived late, got their map with about 20 minutes to go, then shot out to a win. 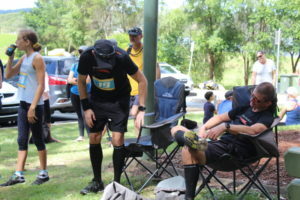 Together in Adventure, coming from Kingaroy, came home in third place, nearly clearing the course, but just failing to grab the last running checkpoint. 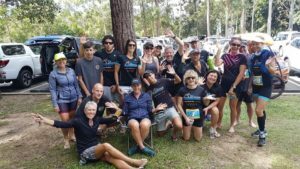 Big thanks to you for coming all the way to the Coast for this race. 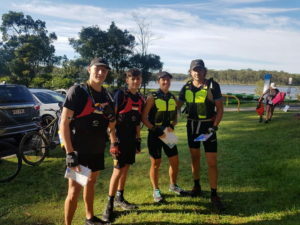 The Mens category was down on numbers this year, however, the boys from Not Ready showed they were ready with a strong win, just edging out our own Xcite AT team. 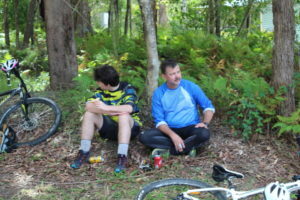 We heard that the Not Ready boys were strong on the bike. Xcite made slight error by covering part of the ride map (second team to do this), and overshot a checkpoint, then having to backtrack. May have been the difference. 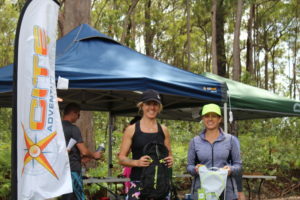 There were plenty of smiles and laughs to be heard at the end of the race, during pizza eating time, and random prizes from Kathmandu. We hope that you all enjoyed the race, and will be back for our next race, which we are currently thinking deeply about. As usual, there are some improvements or innovations we can implement. We had through of providing a day on the lake using our Spirit CTR kayak for inexperienced paddlers to gain a better feel for this craft. We will use these boats in future races as they are good boats and keep everyone on the same type of craft. Also better markers for checkpoints out on the water. If you have any other suggestions, please let us know, as these races are for your enjoyment and progress through the sport.